It took a few tries to interview Hannah and Nick, from the travel blog Salt In Our Hair, because of WiFi limitations in the parts of Southeast Asia they’re exploring. 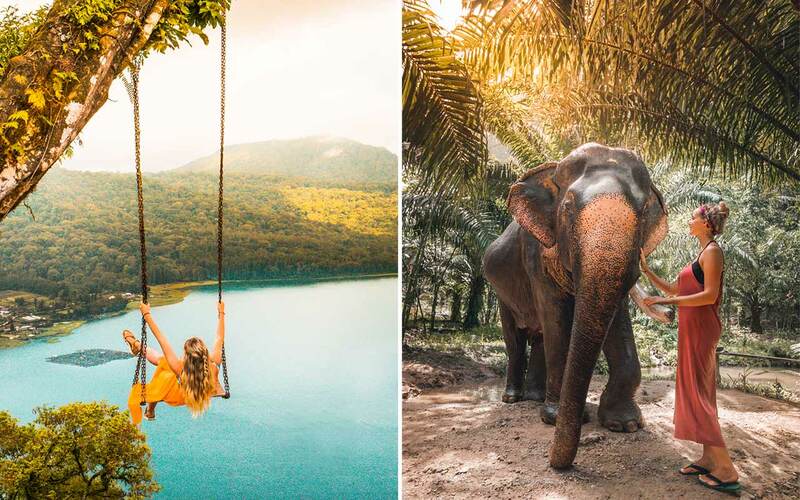 But when they made it to Bangkok, I was able to Skype with the travel couple before they headed out to create dreamy Instagram content for their followers. 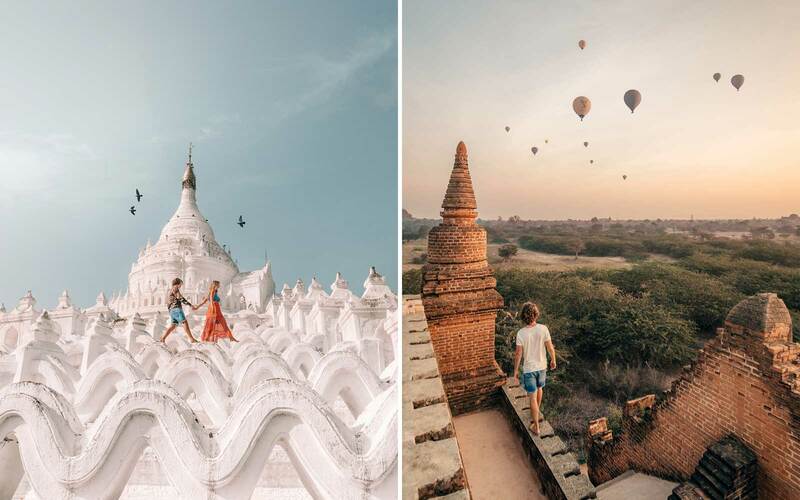 We caught up on their work as full-time travel bloggers, their recent trip to Myanmar, and some of the incredible adventures they’ve had in nearly 20 countries along the way. Devon: Let’s begin with the start of your travel blogging. Can you tell me about your first travel experience and how it led to Salt In Our Hair? Nick: When I met Hannah, she wanted to go to Australia and I wanted to see more of the world. So two years ago we figured, why not travel to a cheap destination together? After that, we could get a house back home in the Netherlands. We started our Instagram on the 4-month trip, and in the last few weeks in the Philippines, we reached around 7k followers and GoPro shared one of our photos. That gave us the motivation to do more with it. From that moment on, we started thinking about the possibility. When we got home a month later, we realized we weren’t ready to get a house and settle down. Hannah: A few months later, when we were back, we decided to start up the blog. In the beginning we thought we didn’t want to blog because it’s so much work. But we had so many people asking us questions on Instagram about our travels that we realized we should do it. For our corporate jobs, I was a graphic designer and Nick was a web developer, so it was kind of the perfect combination to start a blog. We were so hyped about it that we had it ready a few weeks later. Devon: That really is the perfect blogging combination! What has that been like for you now, transitioning into traveling and blogging full-time? Nick: We took about a year and a half to work to this point. We did small trips and holidays. Last year we managed to get more days off from work by getting paid less each month, so we kind of bought holidays from our bosses. Devon: So you transitioned gradually from working full-time to traveling full-time? 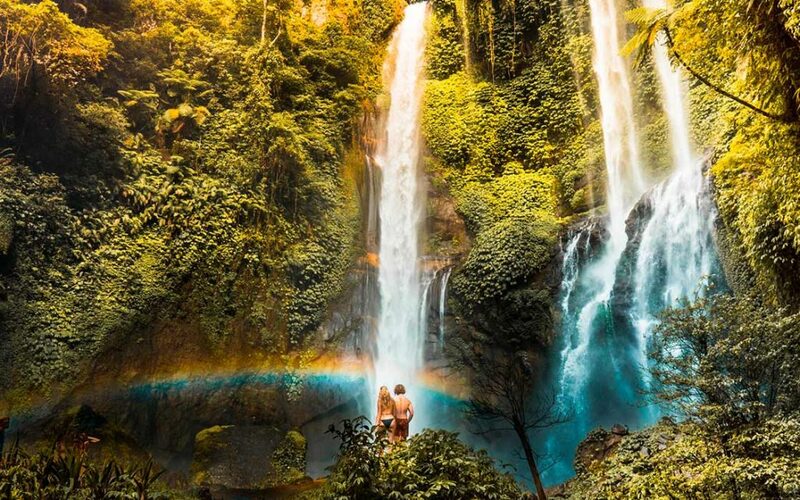 Hannah: When we were in Bali last year, there were so many digital nomads working on the road that we were inspired. We’re at just the right age. We don’t have a house or children yet. It felt like the perfect time to go for it. So last fall we told our bosses that we wanted to quit. It was different going from working a full-time job to not having a “real” job, but we were already working 40 hours a week on Salt In Our Hair. Nick: Yeah, it got to the point where we had to choose between our corporate jobs or the blog. So we thought, why not try this? It’s a little scary that we have to secure our own income each month. That’s still new for both of us. But it’s like we’re on that same trip as two years ago, just trying to get paid each month. Devon: Lately, I’ve been seeing all of your new photos in Myanmar. What was that trip like? Hannah: It was a really great experience. For a long time, we weren’t sure if we should travel there because of the situation near the border of Bangladesh. Since it’s not as well known of a destination, we were so curious that we eventually decided to go. The people were incredibly nice, and the country was really diverse as well. We went to a very tropical beach, and then we went to the mountains. It turned out to be easier to get around the country than we expected. Nick: We try to recommend the country to everyone now. For a few days we had a guide with us, and he acted as a translator between us and the locals. Even though we aren’t normally guide people, we were happy to have him with us because it allowed us to have deeper conversations with the people there. Now we get asked a lot if others should go to Myanmar or if it’s safe to visit, and we totally understand those questions. But meeting the people who make a living from tourism and hearing how there are no tourists makes me want to go back. When people ask, it’s hard to explain in a short Instagram message why. Devon: Now that you’re a full-time travel couple, what is the process of planning out your trips? Hannah: We are always looking into Google trends to compare countries. Nick: Those are the countries we already want to visit. We’ll search to see which one is the most popular at the moment. Hannah: Now that we do this full-time, we try to plan the countries and travels in advance. So for now we have already planned out everything until June. This is our first time doing that instead of deciding on the go. Devon: I’d love to hear more about your experiences. What are your favorite things to do when you travel together? Hannah: Renting a motorbike and just driving around by ourselves. It’s very simple but it brings back the most memories. You get to see so much more than when you’re in a van with other tourists and you can’t stop wherever you want. Nick: Our other favorite thing is probably tasting the food. Devon: Do you have any favorites that you’ve tasted? Nick: Vietnamese food in general. Devon: Do you have any crazy stories or interesting experiences that have happened to you while traveling? Nick: Yeah, when we were in the Philippines for the first time. We waited for about 6 hours in the airport’s Terminal 1. An hour before our flight we found out we had to move to Terminal 2. We quickly got in a taxi and he told us the price and started to drive. Then about halfway there he said a new number, about 60 dollars, for the 10-minute ride. When we got to the airport, Hannah got out of the car to get her bags from the trunk. Then he got out and left the extra money he’d demanded on his seat. So I grabbed the money back. Devon: Did you make it away from him? Hannah: Yeah, but it was quite a scary situation. It was the only scary situation we’ve had since we’ve been in Asia these last few years. Devon: With experiences like that, do you feel like traveling as a couple is difficult or do you think it’s brought you closer together? Hannah: I think it depends on the couple. For us, it’s brought us closer together, because you share so many memories with each other that you can always talk about even when you’re home. Hannah: Traveling together helps you really get to know each other. You’ll learn what each other likes, and see what you can arrange to make both of you happy. Devon: Do you have a destination that you would say is the most romantic place you’ve visited together as a couple? 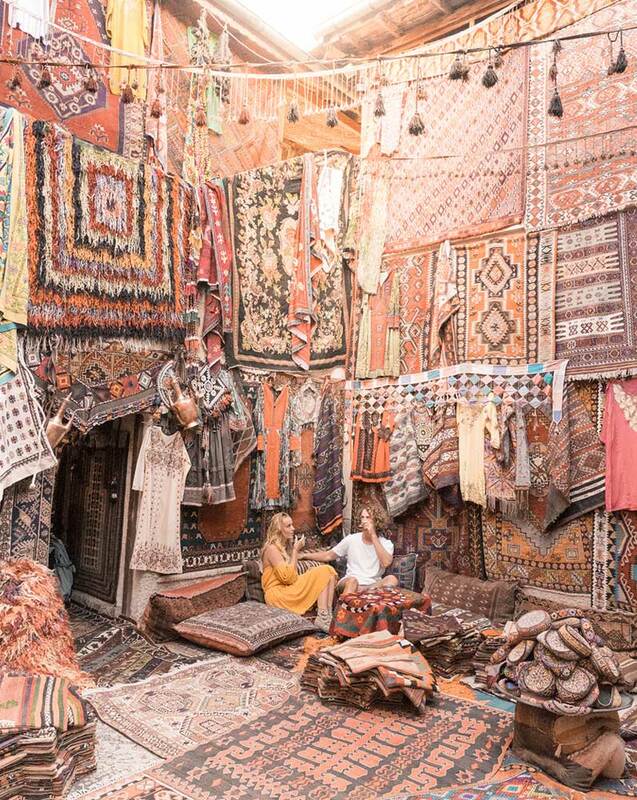 Hannah: For me, it was Cappadocia in Turkey. That trip was only two weeks, so it felt more like a vacation. Cappadocia was a magical place with all the hot air balloons taking off in the mornings. We rented a motorbike there as well, and every morning before sunrise we’d drive to a place where all the balloons took off. It was unlike anything we’d seen before. Devon: Would you say the same, Nick? Is that your pick for the most romantic place that you’ve been to together? Nick: I wouldn’t say romantic, but it’s definitely one of my favorite places on earth. For romantic, I’m not sure. 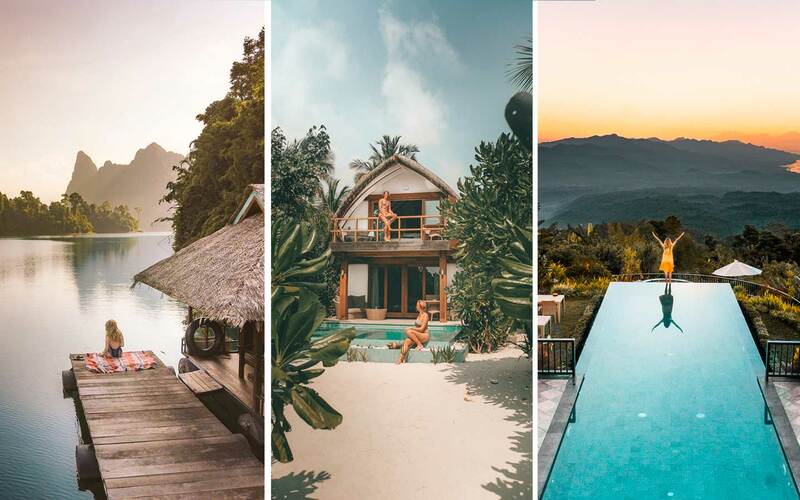 Maybe El Nido in the Philippines because of the tropical vibes. 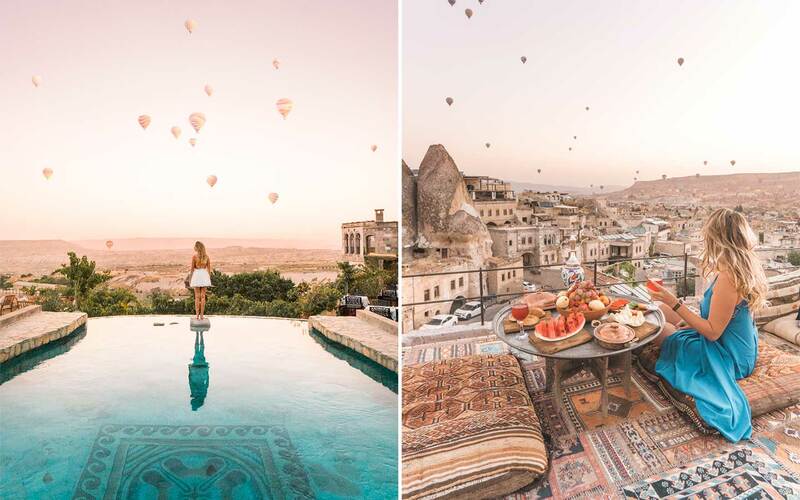 Devon: Seeing the hot air balloons in Turkey is on my bucket list so that sounds really amazing. Nick: If you go, make sure you get to the takeoff site at least once before sunrise. That first day when we got to the site where they take off it was so magical. They were so close when they floated by we could almost touch them. We wanted to record so many things but we decided to just sit back and watch, and return the next morning for more. 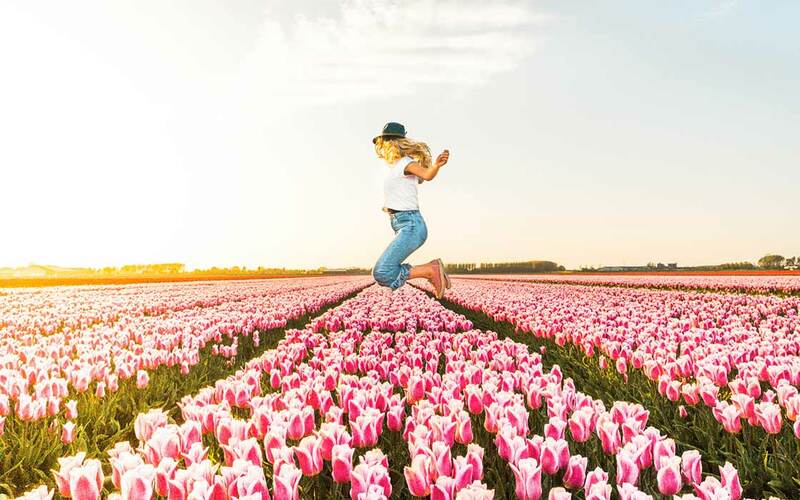 Hannah: Even if you don’t want to spend the money on a hot air balloon ride it’s still magical just to stand underneath it. Devon: What is left on your own travel bucket list? Nick: Nicaragua. It’s a totally different side of the world that we haven’t seen yet. When we’re planning our trips now, it’s a luxury to say, “Where do we want to go?” There’s so much left to see and experience. Follow along with more of the travel moments Hannah and Nick have created on their blog, Salt In Our Hair, and @saltinourhair on Instagram.